How To Paint a Mural | KaBOOM! 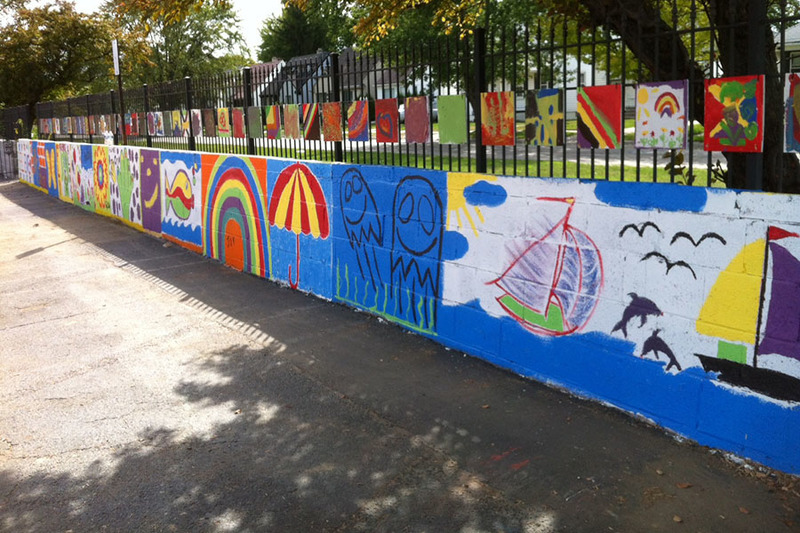 Murals provide color and an imaginative setting to a playspace. They also can be a reflection of the community based on the theme of the mural. Murals can also give communities a sense of historical context for their neighborhood and many murals are considered by the local government to be works of art, which gives the immediate neighbors more leverage when working to make other improvements. Before priming the wall, wash and clean the entire area. For indoor murals, consider using a light sponge and lukewarm water. For outdoor murals, pressure washing or a hose with high pressure nozzle will work best. Scrub any particularly dirty surfaces with a sponge. Let the surface dry before you begin priming. Apply painter's tape along all the edges of the mural, and any other objects inside the mural area (such as light switches, vents, etc.) that should not get primed or painted. Ideally, use a few coats of primer for your mural surface. When the primer is dry, use an LCD or overhead projector to project the mural design onto the wall (if available). Use a pencil or permanent marker to sketch the design that is projected. If appropriate, mark which areas should be painted with which colors. You can also sketch freehand if a projector is not available, though this requires a bit more skill. Cover all areas surrounding the mural area with painter's tape, paper, and/or drop cloths. Refer to the mural design sketched on the wall and the paper drawing (if applicable) as you're painting the mural. Begin with the larger areas and work your way down to the smaller areas. Use a small brush or an artist brush to touch-up areas when the mural is nearly complete. For indoor murals, use fans and/or open windows to help dissipate paint fumes and dry the area quickly. If applying a gloss coat, wait 24-48 hours for paint to dry before applying.